Ekiti State People’s Democratic Party (PDP) Secretariat was on Sunday vandalized by angry National Assembly aspirants protesting alleged imposition of candidates by Governor Ayo Fayose. 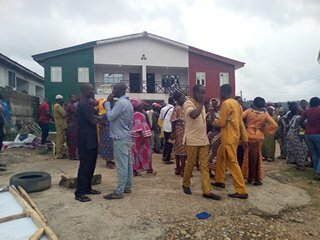 The aspirants and their supporters staged a violent protest at the secretariat at about 11.25 am chanting war songs and demanding the conduct of free and fair primaries. They smashed the louvre windows of the party secretariat in protest against their being denied tickets for the six House of Representatives seats in the state. They alleged that the Appeal Panel sent by the PDP national headquarters has been compromised to impose aspirants being promoted by Fayose on them. During the protest, the angry aspirants and their supporters beat up the Appeal Committee led by Mr. Kareem Oladipupo, and the State Working Committee (SWC) members already already on ground to entertain their complaints. They appealed to the PDP National Chairman, Prince Uche Secondus to overrule the screening committee, which had earlier disqualified some of them to allegedly pave the way for Fayose’s anointed Candidates. They also accused the members of the PDP Screening Committee , led by Mr Seye Shonuga deployed by the National Secretariat to screen the aspirants of allegedly subverting the process to give way for automatic tickets to Fayose’s close allies and incumbent occupants of the seats. The Chairman of the Screening Committee was said to have been spirited away from the venue by party men and security agencies to prevent him from being wounded by irate party members. The aggrieved House of Representatives aspirants contests are Mr Segun Olanipekun, Ademola Salami, Temitope Oluwatosin Ajayi, Goke Omidiran Chief David Arowolo, Adekunle Ojo, Ibrahim Mumini Adewale, Mr. Victor Alale and Mrs Kemi Adewumi. Speaking on behalf of the aggrieved aspirants, Olanipekunn accused the screening committee sent to Ekiti of doing the bidding of Fayose to edge them out of the primary. According to him, the panel allegedly screened them out of the contests under the flimsy excuse that some of them defaulted in the payment of taxes when such did not happen. He said: “It was bad for the PDP that just lost the governorship election to be behaving in this manner. We were supposed to be given the opportunity to test our popularity in the primaries rather than resorting to imposition. “Governor Fayose had earlier held a meeting with all aspirants and told us to withdraw from the race and made it clear that the candidates will be handpicked but we insisted that the primaries must be held. “Our intention then for insisting on the primary was that, Ekiti electorate are very sophisticated . If they see PDP as being unserious by way of imposition, we may not make any remarkable showing in the elections. “Even in Ekiti Central constituency 2, where Hon. Olamide Oni had defected to APC, they technically edged other aspirant out of the primary to give way for the serving Commissioner for Environment, Mr. Bisi Kolawole to emerge automatically.. When contacted to react to the violent protest, the State Publicity Secretary of the party, Mr Jackson Adebayo, said he was not in Ekiti to witness the outrage and that he has not been briefed by the Chairman of the party, Chief Gboyega Oguntuase. He said: “I don’t want to comment on issue I have not been adequately briefed. I don’t want to join issues with them, because they must have told lies.